On May 8, 1909, Loren M. Aderman was born in Lincoln (Logan County) Illinois to Carl and Floy (Bates) Aderman, the second born of their eight children. He died in Bark River (Delta County) Michigan on 11 Jan 2003 at the age of 93. When he was seven years old, Loren moved to Holmes Township, Menominee County, Michigan with his parents and older brother, Oscar. Even though it was 1916, the land in the Upper Peninsula of MI was still rugged. The young family is remembered by their descendants as pioneers in that forest who had to count on their stringent German work ethic to survive. Biz was a hard worker, a very hard worker. That is literally how he got his name. My second oldest brother was christened Loren, but he was rarely referred to by that handle. He was always Biz. He earned that title as an over active little boy who was constantly busy. Family members shortened “busy” to “Biz” and by the time I came along [Ede was born in 1925] I didn’t realize he had another name. . . .
Biz, Oscar, and my two sisters, Nell and Izzy, came to the Upper Peninsula with Mom and Dad from Illinois in 1916. The six of them were true pioneers. With sheer grit and determination, they cleared undeveloped land and established an eighty acre homestead in Holmes Township, Menominee County, Michigan. In an age before tractors and chain saws, Dad and Oscar and Biz poured muscle and sweat into that farm while Mom and the two girls did endless work in the house, barn, garden, and fields. As a little girl, the only times I’d see Biz was when there was hard work to be done. He had left home at an early age, but would help Dad with farm work when needed. Even though the four youngest kids had chores assigned to us, Budge [Virgil] and the twins were too little just then to help in the fields or do heavy work in the woods. That left Oscar and Biz to pick up the slack until the three younger boys could take over. Those two guys were always willing to come home and assist the family with the sweat off their brows. A job at the Niagara paper mill did not suit Biz. Despite moments of regret in later years for leaving the mill, Biz wasn’t cut out for factory work. He loved being outdoors and the freedom that comes with it. He was at his best working in the woods, harvesting in the fields, or creating something with his hands. A succession of jobs followed. He was a carpenter, lumberjack, roofer, farmer, and drove a milk route among other assorted occupations. Lest you think he was all work and no play, he wasn’t. As a young man he played on the Daggett baseball team and enjoyed it very much. For personal amusement he played tunes on a harmonica. Early on, he developed a lifetime interest in hunting and fishing. That was a good thing for us because he would drop in at home with hares he had snared or game birds that he shot. And he was always a sure bet to bring us some bass or trout from his fishing trips to grace our table with. In the wintertime, when he worked in the lumber camps, he had access to bananas, oranges, and other foodstuffs. Biz would bring the family a big box of good things that we normally would never get. Every now and then he’d surprise his little brother and and sister with a Mr. Goodbar candy bar. He was always a sharp-eyed outdoorsman. On one particular occasion Biz and I were walking down the lane when we spotted a partridge. Biz asked me, “Do you want me to get him?” I didn’t know how he was going to do that because he didn’t have a shotgun with him. But Biz being Biz, picked up a rock, flung it at the bird, and killed it. I don’t know what portion of luck to skill was involved, but Biz, I think, tilted heavily toward the skill side of the ledger. As a young man Biz had a wild streak in him. He had a motorcycle that he’d operate while standing on the seat! One time, Biz and a few of his partners disassembled an iron wagon and then reassembled it on top of the cheese house. Everyone suspected that gang, including his embarrassed mother, but they never ‘fessed up to it. Connie and Marcel were Biz’s first two boys from a failed marriage. . . . While on the milk route, Biz met his future wife. 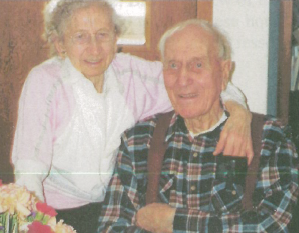 Ann Larson married him during a leap year that was probably the coldest winter ever recorded in the history of the world. [Biz and Ann married on 17 Jan 1940 in Escanaba, Michigan.] . . . Afterwards, Biz and Ann contributed to the family roster with the addition of Gary.
. . . A popular figure around town, it seemed everyone in Bark River (and Delta County for that matter) knew my affable brother. He was an ethical, wise, hard-working, friendly man. If a script-writer were to portray a stereotypical small-town nice guy, he’d use Biz as the model. Thanks Lori. I’ve been enjoying yours the last several weeks, too!